Great for larger phones! This ADORABLE self-lined cell phone clutch is great! It sews up so fast, and has pockets that magically appear. METHOD: "Fuse & Use" - this is EASY! Just fuse, stitch, trim, & turn. All straight sewing, great for beginners! Takes only minutes to make! 9" x 38+" strip required for one bag. May also be made from fat quarters! FIRST TIME USERS - Purchase the "Pack" first which includes instructions and interfacing! Panels are available separately for more bags. 1 panel makes 1 bag. Comes in a 6" x 9" pack with printed interfacing for 2 bags! You will LOVE it! Approximately 5" x 8". 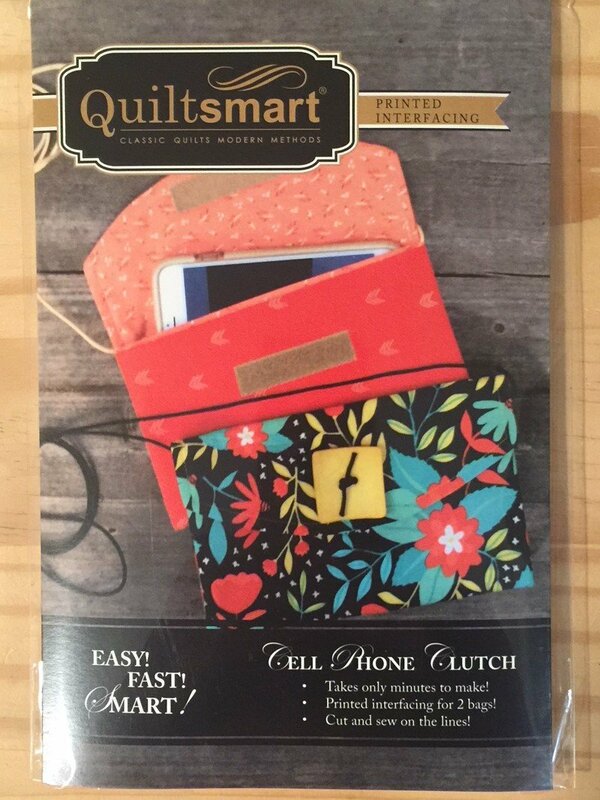 Pack includes (2) panels of Cell Phone Clutch fusible interfacing, cording, Velcro and instructions. VARIATIONS: Want it just a bit heftier than our standard? Add a Heavyweight Stabilizer inside. PEEK DOWN (Scroll) under the VIDEO to see SUGGESTED PRODUCTS!